Stocks walked a lonesome road this week, whistling the blues under their breath, as investors waited for first-quarter earnings season to start in earnest next week. The palpable dread of bears mixed with the sly hopes of bulls to create a mood that reminded me of those pirate movies where the hero is just seconds away from opening a treasure chest … and discovering if it is brimming with gold and jewels or just full of sand. You get the feeling that we are at a binary moment where earnings are either going to beat the hell out of expectations … or they’re going to be as ugly as sin, with no hidden upside. In short, starting Monday morning, either the bears are going to lay down and capitulate and let prices shoot to new highs or the bulls are going to cave and let stocks endure a wretched, painful, exhausting slide. “Buckle up, buttercup,” as the kids say. Someone’s gonna get hurt. At the last closing bell of indecision week, topping the new high list were Microsoft (MSFT), Broadcom (AVGO), Thermo Fisher (TMO), Starbucks (SBUX), Dell Technologies (DELL), Autodesk (ADSK) and Amphenol (APH). That’s a pretty tight group of leaders. Bears are wary of the coming earnings season because dozens of companies have lowered their profit forecasts for the first quarter. In anticipation, trading activity has slowed in recent weeks as many investors are hesitant to make big bets before they see corporate results. On Wednesday, fewer shares changed hands than on any other day of the year. Dovish signals from the Federal Reserve regarding interest-rate increases and its balance-sheet runoff program have lifted stocks in recent weeks. Although economic growth is definitely slowing, some analysts say it is still sturdy enough to support corporate profitability without stoking fears of higher inflation, which could lead to tighter monetary policy. Minutes from the Fed’s last meeting, released Wednesday, showed officials signaled greater conviction that they wouldn’t need to change interest rates this year. Data early in the day showed the consumer-price index rose less than economists had expected in March — the latest sign that inflation is dormant. Lower inflation allows price/earnings multiples to increase, a hidden lever behind higher stock prices. Despite an expected slowdown in corporate profits this year, recent shifts by central banks toward accommodative policy have driven the rally in stocks around the world. Looking a little more deeply at the Fed minutes, they showed that further rate hikes this year are off the table. Most officials continued to view “sustained expansion of economic activity, strong labor market conditions, and inflation near the … 2% objective” as the most likely outcomes over the coming months. Nonetheless, officials still judged that “global economic and financial developments and muted inflation pressures” warranted a patient approach to future policy changes. Despite growing market expectations that the Fed’s next move will be to cut interest rates, there was little evidence that a majority of officials was considering rate cuts any time soon. This is bluster. Experts believe weaker growth would convince the Fed to reverse course by cutting at least three quarters of a percentage point by mid-2020, with the first cut probably coming in the fall. This would be particularly true if the White House manages to insert its homies at the Fed. On some level it appears that the White House is weaponizing the Fed to support the economy going into the 2020 election year. If it manages to bully Chairman Jerome Powell to not just back off from raising rates but actually mount a three-cut campaign next year, there would be a lot of squawking from opposition politicians. 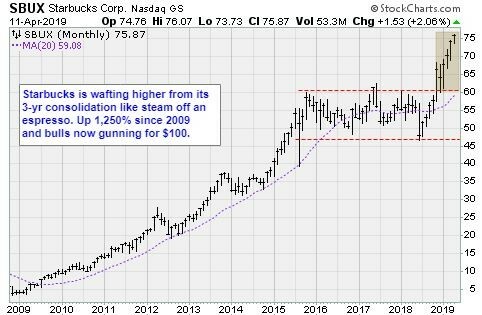 But the market would probably applaud by boosting the shares of companies that benefit from lower interest rates such as home builders, hardware retailers, power tools makers, carpet and lumber makers and mortgage providers. Home Depot (HD) is a good place to get started. So why the glum faces Tuesday? Analysts complained we have moved from progress on China to a new front in Europe. That is one big step in the wrong direction for policy certainty, which investors crave. Part of the problem is trade’s impact on global growth. The International Monetary Fund on Tuesday again cut its worldwide economic growth forecasts for 2019 to 3.3%, down from 3.5% in January. The IMF said its decision was partly due to “trade tensions and tariff hikes between the United States and China,” as well as a decline in business confidence and a tightening of financial conditions. American data is worsening as well. The newest data came from the National Federation of Independent Businesses and JOLT surveys. The NFIB small business optimism index shows an ebbing of confidence that is prompting firms to cut back their investment plans, with the capex intentions index now consistent with an outright decline in equipment investment, according to Capital Economics research. The NFIB report echoes the message from the Fed’s Senior Loan Officer Survey that investment is also starting to be constrained by a worsening availability of credit. Small firms’ demand for labor also appears to be easing, with the hiring intentions index trending lower in recent months. The February JOLT survey showed the job openings rate dropping to an 11-month low, and the job quits rate has been unchanged since mid-2018. Along with the falling share of firms in the NFIB survey planning to raise compensation, this suggests that wage growth may not have much further to rise, the CapEcon analysts observe. Hold off on those plans to buy more bread knives, I guess. Earnings season kicks off next week as some of the major banks are set to report Q1 earnings. JP Morgan (JPM), PNC (PNC), and Wells Fargo (WFC) reported Friday morning, and then Citi (C) and Goldman (GS) will report Monday morning. Let’s take a quick look at how stocks that have reported so far reacted to their earnings reports. Bespoke Investment Group reports that since the middle of March, 67 companies in the S&P 1500 have reported Q1 earnings, and of those companies, 72% have exceeded EPS forecasts, while only half of that amount have managed to exceed revenue estimates. In terms of guidance, just seven companies have raised forecasts while 11 have cut forward estimates. Regarding stock performance, results have generally been good. Bespoke reports that while the average gap up following earnings has been just 0.04%, stocks are averaging a gain of 1.02% from open to close. For companies that have exceeded EPS forecasts, the average gap higher is 2.1% followed by an open to close gain of 1.03%. Stocks that have missed EPS forecasts, however, have been taken out back and flayed, gapping down an average of over 6% and then rebounding somewhat with an average open-close rally of 0.88%. Bespoke adds that even with the equity market off to its best start since 1987 and its fifth best start ever, “analysts just aren’t feeling it.” Over the last month, analysts have raised EPS forecasts for 341 companies in the S&P 1500 and lowered forecasts for 614. That works out to a net of -273, or 18% of the index. This sounds bad, but in a classic stock market paradox, it’s not: With the bar set so low, it should be easy to top expectations. In similar quarters with weak expectations, individual sectors were up during earnings season every time for an average gain of 5.8%. Bespoke concludes that more often than not, when the expectations bar is set low for earnings season, the S&P 500 sees a positive performance. Conversely, when the bar is set high heading into earnings season, the market has struggled during the reporting period. At present, the bar for this earnings season is low. Since the start of 2009, there have been nine prior periods where the revisions spread was more negative than it is now, and in those periods the S&P 500 averaged a gain of 3.8% during earnings season with positive returns eight times. The only down period was Q4 2015 when the S&P 500 fell just 0.22%. Bottom line: Earnings aren’t the only driver of stock prices in the short-term, but from a sentiment standpoint, expectations remain very low. Which, in the upside-down world of stocks, is a positive.